A magnet, the strongest one you can find - flexible fridge magnets don't work. Crush the cereal up into a powder as small as you can manage. Put the magnet into it and shake the whole thing around a bit. Take the magnet out again and have a look at it. With any luck you will find that some of the cereal is sticking to the magnet. If you have another, stronger, magnet, you will find that the cereal particles will jump across to the stronger magnet when you bring them together. You can see little bits of cereal sticking to the magnet With a stronger rare earth magnet the effect is much more pronounced. You need iron to be healthy. It is used by your body amongst other things to make haemoglobin, which holds the oxygen in red blood cells where it is moved around your body. It can be hard to get enough Iron, especially for children, so it is added to various foods such as breakfast cereals. It can be added in various forms, many are not magnetic, but if it is in the form of fine metal particles or ferric oxide (FeO) it will be magnetic. So when you put the magnetic particles near your big magnet they will stick to it. 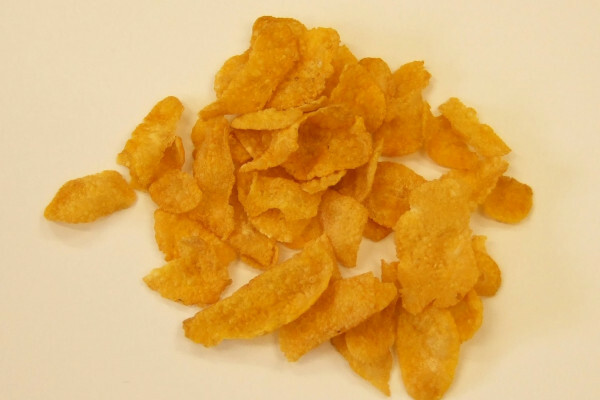 You have to crush the cereal first because the whole flakes don't have many magnetic particles in them, breaking up the flakes means you can just pick up the lumps which contain magnetic particles, this means each magnetic particle has to lift less cornflake.